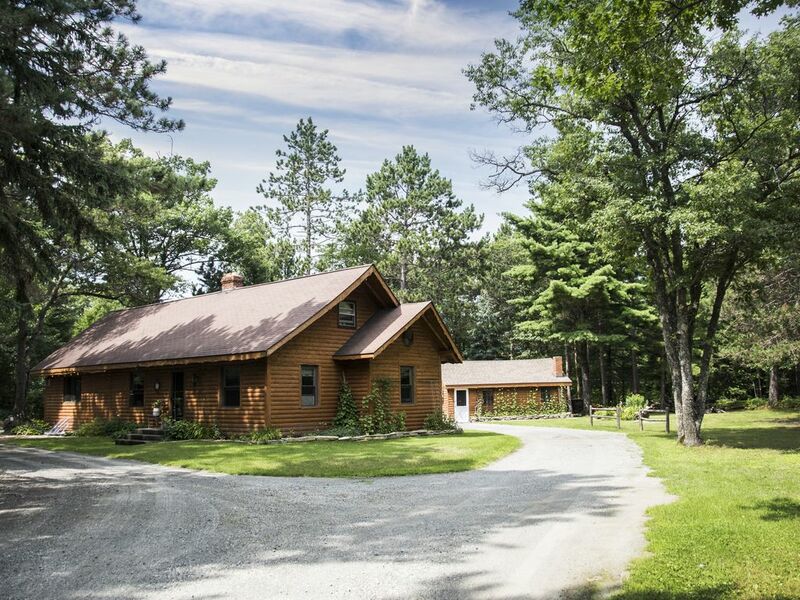 Spacious Rustic Log Home for up to 12 guests at Adventure U.P. Enjoy private beach on Little Bay de Noc. Also a pop up camper on beach with queen and king bed for a real out door experience. Secluded enough for privacy, close enough to check out local highlights. Come and explore all the U.P has to offer and more! - THE MASTER BEDROOM QUEEN-sized PRIVATE bedroom with closet and dresser. - THE GUEST BEDROOM - double sized PRIVATE bedroom with closet, ceiling fan and dresser. - THE LOWER LEVEL SUITE: QUEEN-sized PRIVATE spacious remodeled basement with a private full bathroom, closet, TV, recliner and a futon for extra sleeping space. - ENTIRE house, including a full kitchen, bathroom, a great room with a gas fireplace, a second living room with a log fireplace, and a beautiful spacious dining room. New full sized deck with a screened in patio area. Our home is situated on 2 1/2 wooded acres and 165 ft. of lake frontage. We offer a unique place to stay for a while and relax, or use our place as a home base for exploring all that the U.P. has to offer. Rustic private camping on beach also available. Log wood stove sauna available only when given a prior tutorial (unless experienced Sauna guests). Two campfire pits, one by the home and one on the beach for a relaxing enjoyable evening! Firewood included. Things to do from our home: swimming, kayaking, (kayaks available on request. We have a double and 2 singles) boating, and biking. In the winter, enjoy snowshoeing, cross country skiing or fish right off our beach. But best of all sitting, relaxing, and enjoying the sights and sounds of nature. - Full kitchen with pantry, electric stove, full fridge/freezer (additional fridge in garage), microwave, toaster oven, microwave, coffee grinder and maker, full cooking set including dishes etc, and a multitude of spices. Also toaster oven and microwave. - Unlimited access to over 160ft of sandy beach frontage. Beach is located down a beautiful trail where there is decking, table and chairs also a fire pit for evening campfires. - You may be likely to see abundant wildlife, including eagles, herons, cranes, deer and more. One of our favorite attractions are the many hummingbirds that come to our feeders! - Screen area on deck to enjoy the outdoors when bugs are out. - Wood fired sauna available, please ask for instruction. Welcome to Adventures U.P. We are Morley and Monica, a 60ish couple who live at "Adventures UP" in the Upper Peninsula of Michigan (A.K.A. the U.P.) We have lived here for 34 years and have raised our 3 children here. We are now open to offering our home to groups and families to experience the natural beauty and peacefulness of the U.P. We have spent years tending our property with love and care and love to give others an oppertunity to experience a little of why we love it here. The wildlife and peacefulness of this place lets you really relax and unwind from the hectic pace life can throw at you! We have so many wonderful places to explore in this area but do yourself a favor and take at least a day to relax on the deck, beach or kayak, watch a sunset and enjoy a crackling campfire! Now thats living! !